I’ve referred to Sugen-do in the post about Tengu (Japanese goblins) legends. What’s that? 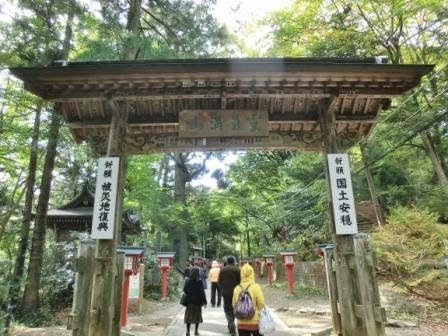 Today I’d like to talk about the unique culture of Shugen with talking about Yakuoin Temple in Mt. Takao. Shugen-do is a mixture of Buddhism and Japanese spiritualism to mountains since ancient times. (“Do” means “way” in Japanese. You know it in Judo. It’s same.) It also got mixed up with Tengu legends in the Middle Ages. Shugen ascetics, called Yamabushi, train themselves to catch spiritual powers of the mountain. Running in a mountain, walking on a fire, and making themselves be hit by a waterfall are well-known ways of Shugen training. Waterfall in English is an exaggerated way to say it, actually. Don’t imagine Niagara Falls. But undoubtedly the water is extremely clear. It is kept as sacred water. We can touch Mt. 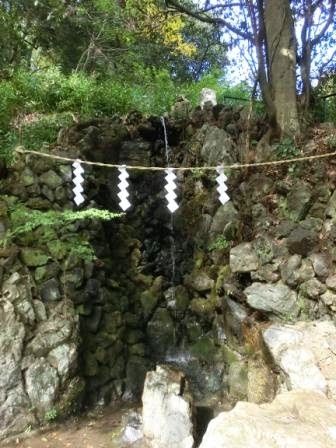 Takao’s cold and pure water when we wash our hands before praying in the temple. You’ll see sculptures like this everywhere in Mt. Takao. Shugen culture and Tengu tales got mixed up so well that people can’t tell which is a Shugen ascetic and which is a Tengu. Yakuoin Temple holds some one-night Shugen seminars a few times a year. Not only professional ascetics, common people take part in it to experience Shugen-do. The schedule is on Yakuoin Temple’s official website. 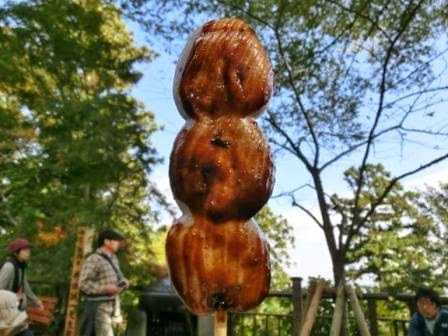 If it’s still too hard, we can try Buddhist Vegetarian Lunch and warmly grilled Dangos (rice dumplings with sweet soy sauce). It’s the easiest way to explore the culture! 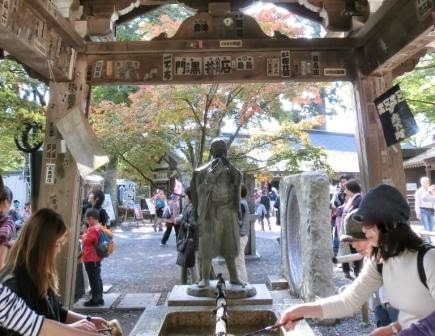 Well, Yakuoin Temple has more which are interesting to visitors. One of them is Relics Stupa. 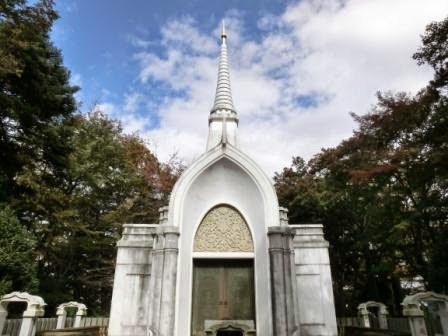 It was built for friendship with a temple in Thailand. The Thai temple gave some Buddha’s bone with praying that young people would grow up healthily, and Yakuoin Temple built this Indian-designed tower for it. The tower itself is very interesting to see, but the surroundings are even more beautiful. You can explore some on my Flickr Album of Mt. Takao. Things like this attract your attention on the way to and around Yakuoin Temple. It is kind of Buddhist sutra to purify our mind by spinning the wheel. The biggest one is near the main hall of the temple. There is Mt. Fuji on it. Why? Yakuoin Temple in Mt. Takao was established in 744. It is said that some ascetics in Mt. Fuji moved to Mt. 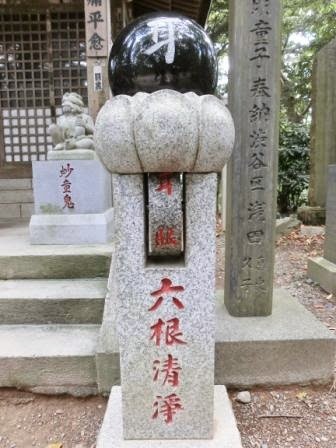 Takao and started Shugen training there in the Middle Age. After that, Mt. 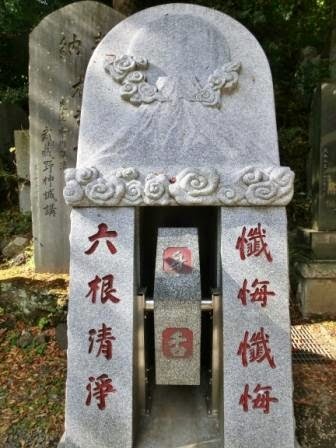 Takao was known to be on the way from Yedo (Tokyo’s old name) to Mt. Fuji by travelers. So Mt. 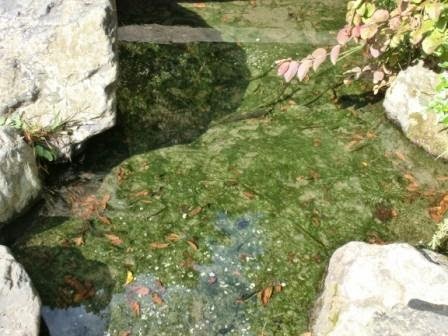 Takao has highly-originated culture and a long history of more than 1000 years. It is not hard to explore them from super modern Tokyo City. Interesting, isn’t it? In the end of this post, I’ll show you my miraculous shot of a Jizo (=guardians of roads in Japanese Buddhism) Statue from my Flickr Album. The sunlight hit directly his head. Looks so holy! And humorous as well! This post is too short to express everything about Mt. Takao’s culture and natural beauty, but I believe that you can explore its essence with Part 1, Part 2 about Tengu tales and this 3rd post. Hopefully, after traditional Shugen culture, the next post will be one of Tokyo’s Christmas Lights again. See you next time! There are 6 and more hiking courses in Mt. Takao. The main course is Trail 1, where you see the Octopus Cedar Tree, Buddha’s Bone Tower and Yakuoin Temple while hiking. It is 3.8 km, 100 minutes to the top. If you take the cable car or the lift, it takes 50 minutes to the peak. Take Keio Line from Shinjuku Station to Takaozanguchi Station. (Both stations are the terminals. This is the best and only way. You need to get to Takaosanguchi of Keio Line, so need to take Keio Line somewhere.) 50 minutes by rapid train. “Mt. Takao Ticket” sold by Keio Railway is DEFINITELY my recommendation. It is a discount ticket that costs just 1380 yen including the return ticket of Keio trains and the Cable Car or the Lift. Unbelievable saving! Even some Tokyo locals don’t know. See The Easiest JR Train Map & The Easiest Subway Maps to learn Tokyo City! Takao Tozan Railway Official Website – The company of the Cable Car and the Lift. There are also maps and hiking guides of Mt. Takao. Keio Railway’s Official Website about Discount Tickets – For the information about Mt. Takao Ticket. You can choose English, Korean, Chinese and Japanese. Hotels in Shinjuku – I think it is the best choice to stay in Shinjuku because this station is the terminal of Keio Line, so it is very convenient for you to visit Mt. Takao. Also, Shinjuku is a convenient place to go anywhere in Tokyo, too. You can choose a hotel from a wide range of hotels there. The Dangos sound delicious!! If think I am always attracted to food you are right 😀 I think waterfalls have a special meaning in many cultures but the history behind this area is fascinating! I remember an American TV personality once said that Japanese waterfalls were like a shower at home, and that's why I noted that they are not like the Niagara. (He was not a black humorist, he was making the TV show cheerful with being respectful.) They are not big, but pure and cold water in a deep mountain is often considered to be special. Beautiful!